Apple has announced some big – and some not so big – upgrades to its iOS operating system at today’s WWDC, and one of the most interesting is its new iCloud service. What does it do? In a nutshell, the service stores your content in the cloud and shunts it in the direction of your devices. The uploading is automatic, with the content being stored and pushed to all your devices without any user intervention needed. Purchased content like music, iBooks, photos and videos will be automatically backed up over WiFi, and calendar, mail, and contacts will also be stored in the cloud and synced effortlessly. Gunning for the new Amazon and Google services, Apple’s iCloud lets music already purchased from iTunes to appear on up to 10 devices. An intriguing new tool called called iTunes Match will rustle through your non-iTunes music (i.e., music ripped from a CD) and if it finds any matches from its 18-million-track iTunes offerings, it will replace the tunes for higher-quality 256k files, and let you stream those songs to other devices – assuming you sign up to the service for $24.99/year, of course. The number of songs will be restricted to 25,000, but there’s no way to share music with friends, create playlists with pals or get jiggy with some of the fun stuff available on unlimited cloud-based music services like Spotify. As far as we can see, it doesn’t match their rivals in one key area in that iTunes Match won’t actually let you to store your music in the cloud, with the service still requiring you maintain your library on a hard disk. The photo syncing is similar to the Android HTC/Picasa service: if you take a photo with your iPhone or iPad, the new pics will be shunted to iCloud automatically, and then pushed to all your devices. iCloud helps you manage your photos efficiently so you don’t run out of storage space on your iPhone, iPad, or iPod touch. When photos are sent to your iOS device, they appear in a Photo Stream album that holds a rolling collection of your last 1000 photos. iCloud stores new photos for 30 days, so you have plenty of time to connect your device to Wi-Fi and get your most recent shots. 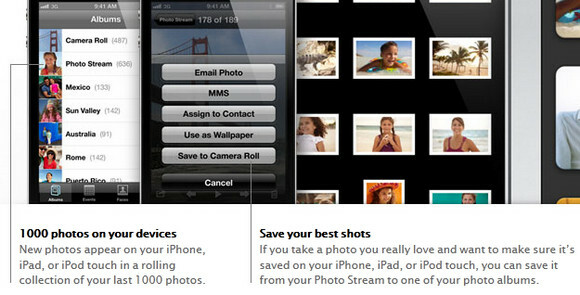 Once they appear in your Photo Stream, you can save your favorite shots to your Camera Roll or any other album on your device. A ‘Master photo library’ will be kept on your Mac or PC, which automatically keeps all the photos taken on a user’s iPhone, iPad, or iPod touch device. 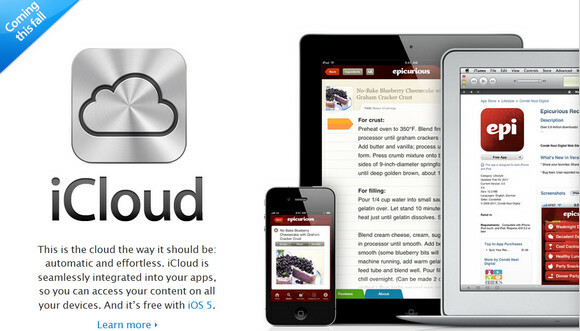 Offering 5GB of advert-free free storage, the new iCloud service is part of the iOS 5 update, and will be released in Autumn.